Thomas D. Mangelsen has been photographing earth’s last great wild places for more than four decades. Through extraordinary talent and patience, his portfolio contains some of the most iconic wildlife photographs of all time. But what Tom is most proud of is his contributions to conservation, and the opportunities his art has presented to him; in the way that he has been empowered to support environmental organizations through special events, projects and the sale of his photographs. Here on the ground in Africa, Tom has been a phenomenal support to Saving the Wild in our mission to expose and eradicate corruption enabling wildlife poaching. It is critical Africa holds the line, so that when the demand is crushed, there are still animals to save. Ultimately, this war on poaching can only be won in China, in the wise words of WildAid’s mantra: When the buying stops, the killing can too. Tom released his Legacy Reserve Collection a few weeks ago; his 40 rarest and most resonant images, numbered 1 to 20. He has donated number 8 of Amboseli Crossing ‘Elephants in the Dust’ to the WildAid Gala, taking place on 11 November in Los Angeles. In 1989, CITES banned the global ivory trade. A failed experiment allowed Japan to buy 55 tons of ivory legally in 1999, resulting in a rise in smuggling. Then, in a bizarre move in 2008, China got the go to buy 73 tons of ivory from Africa. They built the world’s largest ivory carving factory and began opening shops to sell ivory. Investigative reporting has shown that around 90% of the ivory that came out of China’s carving factories was post the 1989 ban – harvested from the illegal killing of elephants. A legal market had created a laundering channel for the illegal market to flourish. The question that hangs in the air; Are you willing to own a piece of “art” that is driving an iconic species into extinction? 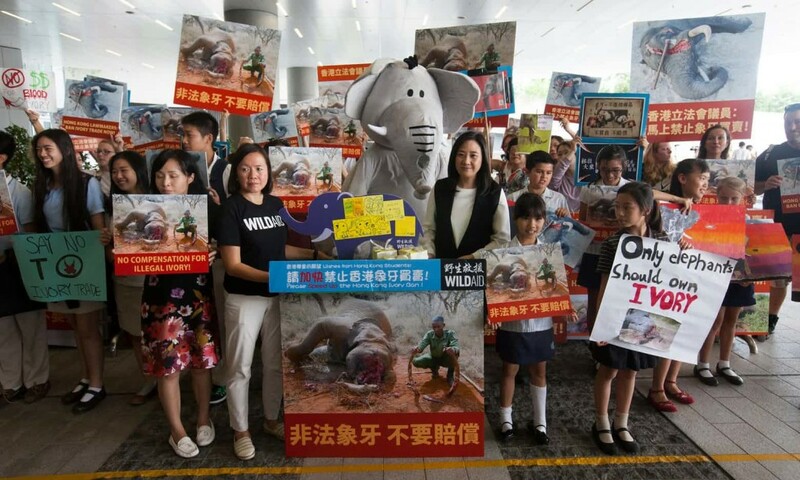 WildAid took ‘the elephant in the room’ to China, and through aspirational multi media campaigns, many Chinese people no longer believe tusks simply fall out like teeth, or that they grow back after being cut off without harming the elephants. By November 2016, WildAid polls showed that 78% of Chinese who had previously bought ivory said they would not buy it again. Of these, 89% said that they had been convinced after learning that purchasing ivory can lead to the poaching of elephants. Support for a ban on the sale of ivory in China reached 95%. In September 2015, the announcement from the United States and China that they will work together to enact “nearly complete bans” on the import and export of ivory was hailed as a game changer and a huge blow to ivory smugglers. By the end of March this year, ivory factories in mainland China were officially shut down. The rest of the retail outlets have been ordered to close by the end of the year. Hong Kong, home to the world’s biggest retail ivory market, is procrastinating. They announced a bill in June 2017 that would ban the import and export of worked and raw ivory by 2021. There is still much work to be done. Tom photographed his critically acclaimed, sold out Amboseli Crossing in 1994, and the impact of the 1989 ivory ban was palpable. Between 1979 and 1989, an estimated 600,000 elephants were murdered for their tusks. Tom then asked his guide to go a mile ahead, where they waited and hoped they were in the right spot. The elephants paid little attention to them, except for the final 80 yards when the matriarch communicated with her family to line up behind her, perhaps in a strategic move of caution. These sentient giants will go to great lengths to protect their family, and they have incredible communication skills which is beyond human comprehension. Amboseli Crossing is a tribute to a famous pachyderm mother named Joyce, matriarch to a much beloved sub-herd known as the “JA” Family. Their legacy as one of the most studied groups of elephants is especially poignant as poaching and habitat loss continue to reduce elephant numbers across Africa. Cynthia Moss, founder and director of the Amboseli Trust for Elephants, is a huge admirer of the image, which she calls historic. “When you look at this 1994 Mangelsen photograph, Joyce had just taken over the role of matriarch because the “JA’s” glorious old matriarch Jezebel had died in November 1993,” Moss says. Amboseli Crossing remains a powerful touchstone; an inspiration to fight on for a vanishing species that has roamed planet earth for 35 million years, and still has much to teach us humans about compassion and family. 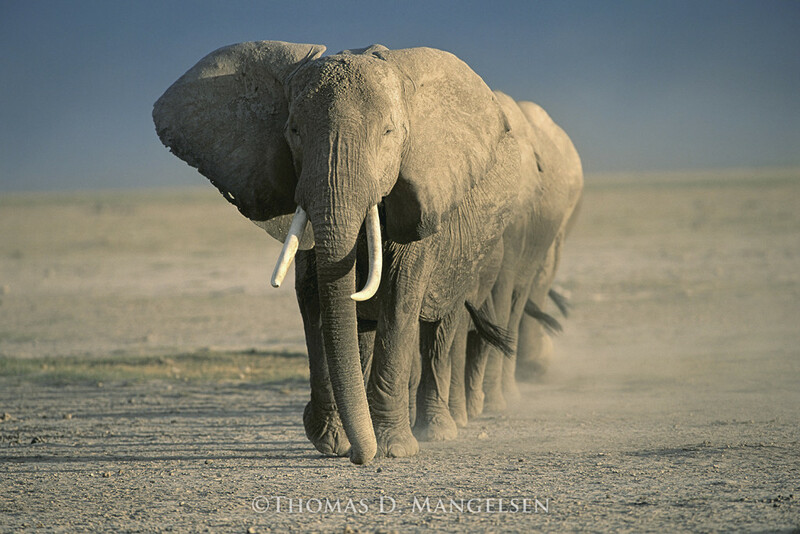 To learn more about “Amboseli Crossing” visit http://www.mangelsen.com/legacy. To attend the WildAid Gala, visit http://www.wildaid.org/gala2017. When you become a collector of a Mangelsen Legacy Reserve masterwork, you also gain an unparalleled experience in art collecting. It includes a day in the field with the legendary photographer himself, searching for the iconic wildlife of Grand Teton National Park. The experience is capped off by an evening with conservationist Dr. Jane Goodall at Mangelsen’s home along the base of the Teton Mountains.